Could this be the result of another hub reconnecting to the grid after being offline for some time? maybe at that moment the queue of messages has been reduced by a large number? Maybe at that moment the number of the limit that held the messages in the queue has decreased, below the preset, and a lot of messages have all left together? Were any channels created (i.e. imported) to your server around that time? @Mike Macgirvin There hasn't been any new accounts been created during that period, I'm getting an email every time a new account has been created. 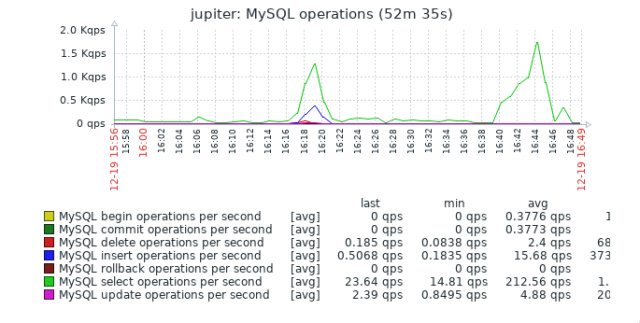 Anyway, according to zabbix most traffic has been outgoing (I'd expect more incoming traffic when someone creates a clone in the hub), but lots of mysql connections and queries which I can't explain for now.